Collingwood has defeated Essendon by eight points in a tight affair in the Bluestar Cup at Victoria Park on Saturday afternoon. Despite booting the first five goals of the game the Bombers never regained ascendency after quarter time as skill errors and the an inability to win clean possession around the contested costing them. Cory Dell’Olio and Joe Daniher both booted five goals for the Bombers but wasted opportunities cost the away side late in the game. Coach Hayden Skipworth said it was disappointing to lose another close match; the Bombers third close loss of the season. “We have a habit of losing these close ones at the moment so I talked them through after the game what we need to do in that last quarter,” Skipworth said. Hal Hunter (22 disposals) was important through the midfield and along with Will Hams (18 disposals) the pair tried to ignite the Bombers midfielder brigade in the second half. Co-captain Ben Duscher (20 disposals) also provided a mature body around the contest. Kyle Martin was the dominant midfielder on the day and was awarded the Bluestar medal for best on ground working in tandem with big man Ben Hudson. Hudson palmed the ball brilliantly to the Magpies midfield all day giving them important first use of the ball. Scott Gumbleton (21 disposals and 11 marks) again provided an important marking target around the ground. 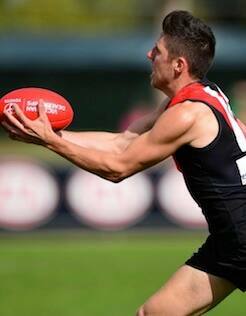 Goalkickers: Daniher 5, Dell’Olio 5, Bate 3, Hunter, Gumbleton, Gleeson, Knowles. Best: Duscher, Hunter, Daniher, Dell’Olio, Pears, Hams, Gumbleton.